From our perspective on Earth, if you (safely) observe the sun it appears yellow and, sometimes, a little reddish. The yellowish appearance of the sun is mainly caused by the way that the atmosphere scatters blue light. Also, yellow is the brightest wavelength the sun emits that can be seen with the naked eye (just take my word for it, don’t go around looking at the sun without proper protection). The sun, in fact, emits light in all wavelengths. When you look at a picture of the sun taken in visible light from space (such as pictures from the Apollo missions, the International Space Station, and other similar projects) the sun will appear white – this is because, without the atmosphere scattering the light, all of the visible colors are seen at the same time; this is known as white light. While we can learn a lot about the sun by observing it in the visible spectrum, we can greatly expand on that knowledge by observing different wavelengths that are invisible to the human eye. By building specialized telescopes, we can learn about the sun’s composition, activity, and keep a closer and more accurate eye on the sun. Ultimately, this allows us to be better prepared for whatever the sun throws at us. 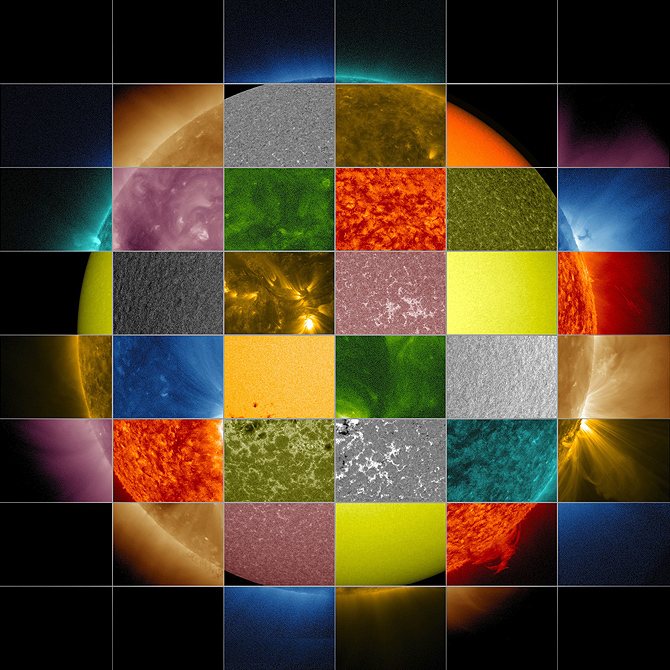 This picture shows 12 different wavelengths through which we observe the sun. Each wavelength has a specific purpose and a specific usefulness; each reveals a different piece of the puzzle. So, what do they all mean? (In an attempt to direct you to a picture for each explanation, I’ll treat the entire image like a grid starting from the upper-left corner). HMI Dopplergram (grey image, down-2 over-3): This image shows the velocity at which the photosphere (the sun’s surface) is moving. HMI Magnetogram (grey image, down-6 over-4): This image allows us to map the Sun’s magnetic field and how it interacts with the photosphere. Here, the black lines represent magnetic lines which are pointed away from Earth and, likewise, the white lines represent magnetic lines which point towards Earth. HMI Continuum (yellow-orange image, down-5 over-3): This image is taken in a broad range of visible light. AIA 1700 (purple image, down-7 over 3): Ultraviolet light continuum. It shows the photosphere (the sun’s surface) and portions of the chromospheres (the sun’s atmosphere). Temperatures here are in the 4500 Kelvin range. AIA 4500 (yellow image, down-4 over-5): White light continuum. This image shows the photosphere and shows temperature ranges of 6000 Kelvin. AIA 1600 (dark yellow image, down-3 over-5): Observing regions of the sun in the photosphere and the transition region, temperatures here hover around 10,000 Kelvin. This wavelength of light is emitted by carbon-4. AIA 304 (red image, down-6 over-2): Observing regions of the sun in the transitional region and the chromasphere, temperatures here are around 50,000 Kelvin. This wavelength of light is emitted by helium-2. AIA 170 (gold image, down-4 over-3): Here, we observe the upper transitional region and the quiet corona, temperatures here are around 600,000 Kelvin. This wavelength of light is emitted by iron-9. AIA 193 (light brown image, down-7 over-2): Here, we observe the corona and flare plasma. Here, we observe iron-12 which is at temperatures of 1,000,000 Kelvin and iron-24 which is at temperatures 20,000,000 Kelvin. AIA 335 (blue image, down-5 over-2): Here, we specifically observe active regions in the sun’s corona, temperatures here are around 2,500,000 Kelvin. This wavelength of light is emitted by iron-16. AIA 094 (green image, down-3 over-3): Here, we observe flaring regions of the sun, temperatures are around 6,000,000 Kelvin. This wavelength is emitted by iron-18. AIA 131 (teal image, down-6 over-5): Here, we flaring regions of the sun. We are observing iron-20 and iron-23 which burn at temperatures above 10,000,000 Kelvin.